The Connective Corridor has been selected by the American Public Works Association (APWA) New York Chapter as the 2013 Transportation Project of the Year. The award will be presented Nov. 14 at APWA’s annual meeting hosted by the Central New York branch. The award recognizes the City of Syracuse and Syracuse University, as well Barton & Loguidice, P.C. 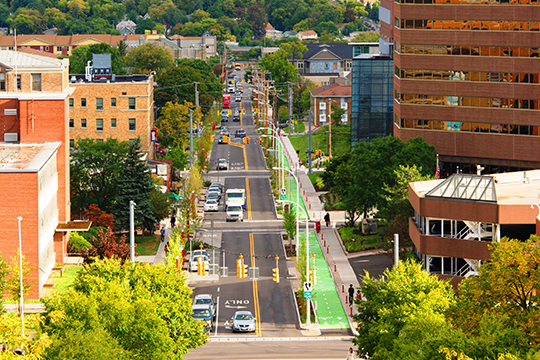 (B&L), a Syracuse-area firm that provides engineering and construction services, environmental services, transportation and infrastructure planning and landscape architecture. The award comes on top of a number of recent honors. Earlier this year, the Connective Corridor received the 2013 American Council of Engineering Companies (ACEC) Platinum Award for Transportation Projects. The Institute of Transportation Engineers New York Upstate Section also recently named B&L senior project manager Mark C. Budosh its 2013 Transportation Professional of the Year for his role designing and shaping the Connective Corridor. Last fall, the corridor won the 2012 Transportation Project of the Year Award from the Institute of Transportation Engineers (ITE), an international educational and scientific association of transportation professionals, presented at its upstate chapter conference in Syracuse. Syracuse-based C&S Companies provides construction administration and inspection under the direction of Gregory Fehrman, manager of construction services at C&S. Fehrman, an SU engineering graduate, is also an adjunct faculty member at SU and developed a construction controls course within the engineering program based on the Connective Corridor. Barrett Industries is the lead contractor for the corridor, working with a broad range of regional subcontractors. Many of these companies employed recent SU graduates in civil engineering and other disciplines who worked on the corridor project. It is estimated that Phase One of the corridor created 86 engineering and construction jobs. Phases Two/Three of the corridor began Nov. 4 with construction expected to wrap up by the end of 2015. The next phases continue from Forman Park along East Genesee Street through downtown, wrapping around Fayette Park to West Fayette Street and stretching to the Nancy Cantor Warehouse. The new complete streetscape will contain design elements that are similar to phase one. When complete, the corridor will feature nearly one-and-a-half miles of new green methacrylate bike lanes and a sophisticated green infrastructure network that will harvest and manage nearly 6 million gallons of storm water annually. Project partners include Syracuse University, the City of Syracuse and Onondaga County’s Save the Rain program.